Call or stop by to visit and explore our showroom. a downloadable map and directions. Tell us about your dreams for your remodeling project! Connect with the talented, expert team at McClincy's to begin the process of making your dream home come true. Call or stop by to visit our conveniently-located Seattle-area showroom in Renton Highlands. Complete the form below to tell us more about your home remodeling and renovation project. You will receive a response on the following business day (Monday – Friday). Note: Your privacy is protected! We never sell, rent, or otherwise share your information with anyone. 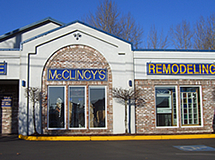 McClincy's serves King County, Pierce County, Snohomish County: Auburn, Bellevue, Bothell, Burien, Covington, Des Moines, Federal Way, Issaquah, Kent, Kirkland, Lynnwood, Maple Valley, Mercer Island, Mukilteo, Puyallup, Redmond, Renton, Seattle, Snohomish, Tacoma, Tukwila, Woodinville, and surrounding cities.